The recent summit of Latin American leaders in Cuba was a textbook case of political tourism and empty pledges, but something very good may have come out of it - saving the four-country Pacific Alliance trade bloc. The leaders of the Pacific Alliance - the ambitious trade bloc made up of Mexico, Colombia, Peru and Chile - held several bilateral meetings on the sidelines of the Community of Latin American and Caribbean Countries (CELAC) summit in Cuba, and talked at length about the future of their trade bloc. What was especially important about these lateral meetings was that they were also attended by Michelle Bachelet, the left-of-center president-elect of Chile. Bachelet, who takes office on March 11, flew to the Cuban summit at the invitation of Chile's outgoing president, Sebastian Pinera. Before Bachelet's trip with Pinera to Cuba, there had been serious concerns about the future of the Pacific Alliance because of reports that Chile will cool off its support for the group once Bachelet takes office. First, there was the question of whether Bachelet will enthusiastically back a regional group that was founded by her predecessor and political rival. Second, Bachelet's campaign platform has explicitly called for Chile to downplay its activism in the Pacific Alliance, and promote stronger ties with Brazil and other Atlantic coast countries. But the bilateral meetings on the sidelines of the CELAC summit in Havana may have helped the leaders of Mexico, Colombia and Peru persuade Bachelet not to drastically diminish Chile's active role in the Pacific Alliance, well-placed officials who participated at the meetings in Havana told me. During separate talks with the leaders of Mexico, Colombia and Peru, Bachelet received assurances that the Pacific Alliance is not a pro-American bloc that wants to split Latin America in two, as some other CELAC members claim. She was further assured that the Pacific Alliance is not aimed against the region's Atlantic coast countries. Unlike other mostly ceremonial integration groups in the region, the Pacific Alliance is all about business. Among other things, it is creating a free trade area among member countries, establishing joint trade offices in Asia and Africa, and creating a four-country common stock market. As for the larger, much-publicized CELAC summit, one just needs to read its final declaration to realize it was a farce. The final declaration says participating countries "ratify our irrevocable will...to strengthen our democracies and all human rights for all." It's no joke: they pledged to strengthen democracy and human rights at a meeting presided over by Gen. Raul Castro, a military ruler whose family dictatorship has not allowed a free election, political parties or independent media in 55 years. What's just as bad, they signed the declaration at the very same time as the Cuban regime was rounding up hundreds of dissident leaders to prevent them from holding peaceful demonstrations during the summit. To his credit, Pinera met in Havana with Ladies in White opposition leader Berta Soler. And Costa Rica President Laura Chinchilla sent a government delegation to meet with Cuban Human Rights Commission leaders. The 70-point CELAC declaration was full of empty pledges to "continue advancing" toward Latin America's economic integration," but without any concrete steps to do so. Sadly, there are now almost as many Latin American integration organizations as countries in the region. Despite these summits, Latin America continues to be one of the least integrated regions in the world: only about 18 percent of Latin America's total trade is within the region, as opposed to 65 percent of the European Union's total trade, according to United Nations figures. Why did Latin American presidents lend themselves to the CELAC charade? Mexico and Brazil want to be well positioned diplomatically and economically for the inevitable transition in Cuba. Other countries, in light of Cuba's recent measures such as allowing its people to travel abroad, believe that it will be more effective to "accompany" the Cuban regime toward greater changes than antagonizing it. My opinion: It was pathetic to see Latin American presidents waiting in line to appear in smiling pictures with Raul and Fidel Castro. Many of these leaders will regret these pictures when the Castro brothers die, and the full extent of their human rights abuses comes to light. If something good came out of the CELAC meeting, it may be things that happened on the sidelines, such as the meetings in which Bachelet may have been persuaded not to turn her back on the Pacific Alliance. 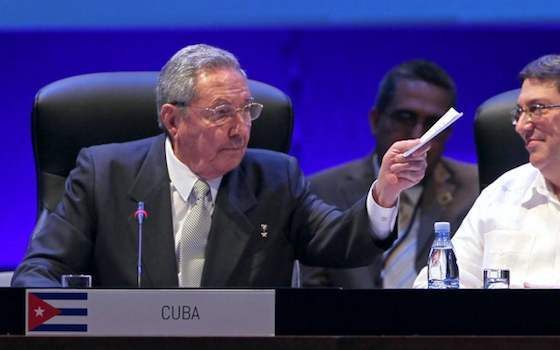 "Summit in Cuba Mostly Political Tourism"